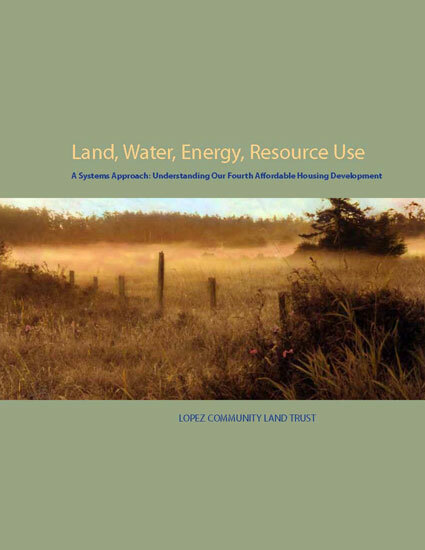 Lopez Community Land Trust’s fourth development, Sustainable Community Homes, consists of eleven single family residences comprising the Common Ground neighborhood, LCLT’s office and two studio rental apartments. In addition to the buildings, the project showcases strawbale construction, a rainwater system, rain gardens, solar photovoltaic and solar thermal systems. use by up to 48% through passive solar design features. home and financial incentives reward those who use less. In this manual LCLT shares the design principles and technologies used as we worked to get close to our vision of “Getting to Zero.” We hope others will learn from our success as well as from our shortcomings and we look forward to learning even more from those who surpass us. This 103-page manual is available digitally only. To purchase the manual, please email LCLT@rockisland.com or call (360) 468-3723.